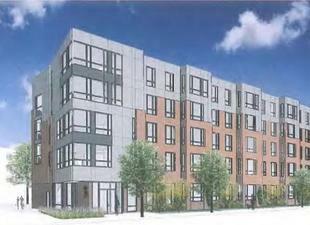 A Boston real estate company is proposing to add a 44-unit apartment building to an affordable housing project it owns in Lower Roxbury. Hamilton Northeast Development is proposing to build the five-story apartment building at Douglass Plaza, just off Tremont Street near Massachusetts Avenue, according to a letter filed with the Boston Redevelopment Authority Tuesday. The 49,305-square-foot building would go up on a landscaped lot on Camden Street that is an unfinished part of the Douglass Park development. The project, which sits just south of athletic fields being redeveloped by Northeastern University, includes two other buildings on Columbus Ave. with 134 apartments and 33 condominiums. Hamilton bought the entire property, including the undeveloped lot, in 2013 for $52 million. No cost was given for the project, which will include affordable units under the city’s inclusionary zoning policy. Parking will be provided in an existing garage on the site that has extra capacity. Allston-based Hamilton, which is headed by longtime Boston landlord Harold Brown, owns and operates more than 5,000 apartments in Eastern Massachusetts.